SIM2 launches the world's first active 3D LED projector | What Hi-Fi? We caught a glimpse of the new SIM2 M.150 active 3D/LED projector at last weekend's Bristol Show, and now comes news of its official release in the UK at £19,995. 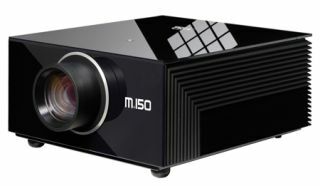 The M.150 brings "the extra immersion of the 3D big picture experience to the benefits of LED projection", says SIM2. Benefits include no lamp changes, instant on/off, lower power consumption and superior black levels, it claims. The projector uses a trio of new, more powerful Phlatlight LED modules to act as both light and colour source for the DLP chipset. This LED light source will last the entire lifecycle of the projector, equivalent to 30,000 hours. Other technical highlights include the latest TI Darkchp4 chipset with DynamicBlack technology, giving a claimed contrast ratio of 100,000:1. A light output rating of 1000 ANSI lumens, a "smoother, more natural 3D image", autocalibration and a 'paint with light' feature complete the spec.